I let myself get in a funk again and I'm scrambling for "fire engine" inspiration. A little while back Amanda sent me a letter where she shared her fire engine thoughts and they meant so much to me that I thought maybe you would be inspired by them as well. 1. If you feel sad, let yourself feel sad. Be kind to yourself and let yourself feel what you feel. 3. Re-read your favorite books, even just a few pages. Favorite books become a part of you. 5. Re-arrange your vanity or dresser top. 6. Frame a favorite picture of yourself. 7. Take yourself on a date to a new place you've never been to and write in your journal or read. 8. Find a pretty card in a store, buy it, and write something nice to yourself in it, then frame it. That way you always see the card, and know what it says inside every time you see it. 9. Play and connect with animals. I adore it and I am going to spend the next couple of day's working through it. I hope you feel like a "fire engine" everyday but if you don't, you can. 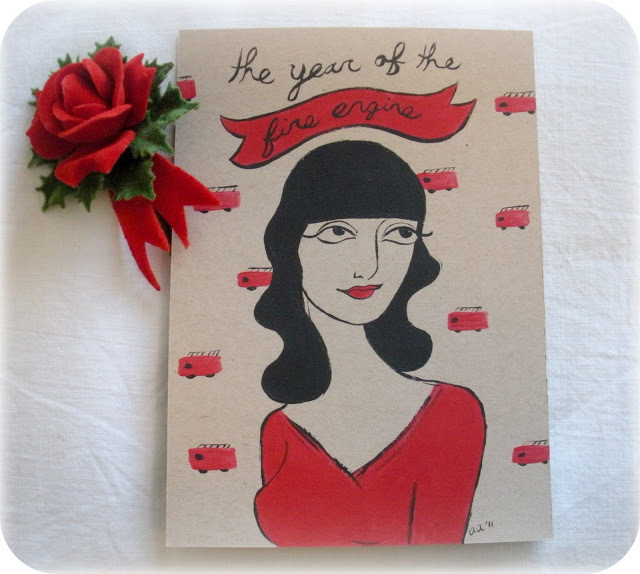 Here's to our year of the fire engine. What an amazing list. Very inspiring. The only thing I would add to it is to call my Mom-- she always makes me feel better when I'm feeling down. I hope you get feeling good again. You are amazing and beautiful and so very sweet. I got in a funk too but the fire engine came back!! This list is great and so honestly true. Thanks for letting me read, it was a pick me up! if anyone needs amanda's list right now, it's me. i had all my hair chopped off. and i let the stylist leave it grey. it's awful. yes, i'm letting myself feel SAD. tomorrow maybe i'll uncurl myself from the fetal position long enough to go find some flowers! i hope you start to feel better in your time.